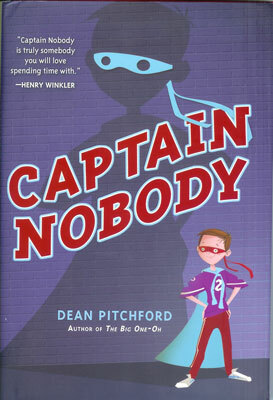 Captain Nobody by Dean Pitchford. Grades 3-5. Putnam Juvenile, July 2009. Copy provided by my local library. Newt Newman is practically invisible. His older brother Chris is a high school football superstar, but even their parents don't seem to notice Newt most of the time. When Chris is injured in a game, Newt feels more invisible than ever until he creates a Captain Nobody costume. In his Captain Nobody costume, Newt discovers that he not only has what it takes to be noticed, he has what it takes to be a hero. I loved the tone of Captain Nobody. In my opinion, the book is pitch perfect - funny without being silly and serious without being depressing. Newt is really in a bad way at the beginning of the book, something that's obvious to the reader even though Newt doesn't seem to acknowledge it. Always outshone by his big brother, Newt has assumed the role of invisible helper boy. He makes breakfast for his family (and sometimes they eat it, unless they're distracted by more important things). He can always remember where his mom left her keys. But when they go to Chris's big football game, his parents are so distracted that Newt gets squeezed out of his seat and kicked out of the stadium. Newt has really internalized his feeling of being invisible. That's the way things have always been and Newt doesn't feel like he has any power over it. All that changes when his two friends insist that he come up with a Halloween costume. From the moment that Newt pulls the mask over his face, he starts to feel different. He gives himself permission to become someone new. And change he does. Newt starts facing his fears and gets into a few accidental heroic situations and before you know it, he's started believing in himself. I know, I know. That sounds like it's kind of hokey, right? Well, Pitchford does a great job at keeping it from being hokey. Although the bits where Captain Nobody becomes an accidental hero might stretch your suspension of disbelief, Newt's transformation felt really organic to me. This isn't a book written to teach kids that you should believe in yourself, but rather a book about Newt's journey and the wacky adventures along the way that happen to lead to him believing in himself. A recurring theme in the book is that things may be different than they appear. Although Captain Nobody is a ten-year-old in a homemade costume, he's a hero to many people in the community. This would make a great choice for book discussions or for reading together with your child and talking about it. This is a book for wimpy kids and overlooked siblings. This is also a book for kids who maybe need to see that there are different ways of looking at problems and situations. And I love that it's about a boy dealing with emotions, but not in a particularly touchy-feely way. Did I mention that it's not depressing*? Read more thoughts about Captain Nobody at 5 Minutes for Books, Books for Boys, and The Boy Reader. *That is, I didn't find it depressing. Kyle at The Boy Reader, having been through a situation similar to Newt's, might disagree. I've been trying to think of a good book to get my nephew. This might be it!